Michael W. Perry is one of the most recognized and respected names in Hawaii broadcast history, having spent over a decade as Hawaii’s number one afternoon radio personality and 33 years with KSSK Radio’s Perry and Price Show, consistently Hawaii’s #1 radio program, and one of the top 3 most dominant radio shows in America. 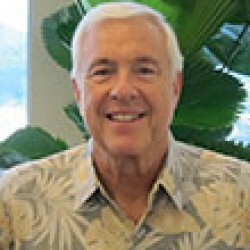 For almost 3 decades, Mr. Perry was Executive Producer and Host of the award-winning “Hawaiian Moving Company” TV show. In addition to being a spokesman for several local companies, Mr. Perry has done countless national and international TV commercials (his acting credits include the 1998 movie “Molokai: The Father Damien Story,” the “Princess Kaiulani” movie, TV performances on “One West Waikiki,” “Jake and the Fatman,” “Island Son,” the mini-series “Blood and Orchids,” and many more). Before coming to Hawaii in the early 70’s, Mr. Perry served as a Navy Lieutenant in the Pacific Submarine Force. He holds a B.S. degree in Psychology from Michigan State University, and, along with Chairing the Takitani Foundation, is Chairman of the Board of the REHAB Hospital Foundation and serves as a director of Castle Medical Center, and Friends of Hawaii Charities.